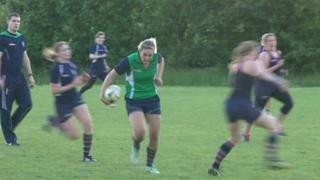 A women's rugby union team, which has only been running for two years, has already won the National Challenge South East West 1 in their first competitive season. Abbey Nuns RFC from Caversham, near Reading, say they have benefited from England women's World Cup triumph in 2014, with many more women joining them since the national team's success. More than 18,000 women and girls play the sport in this country and the number of participants continues to grow. The Nuns are always on the lookout for new players though. And BBC South Today's Adina Campbell got involved in a training session with the Nuns to experience the thrill of the sport.